A new academic year’s around the corner, which in addition to chilly weather and a pleasing number of beer and cider festivals means more trips for me up to the Shakespeare Institute’s home base, the University of Birmingham. Most of the daytime is spent in meetings, making plans for the semester to come, but around the edges of those days comes time to explore the city, to eat amazing food, to talk to people, and to head off to the theatre when night falls. In the past week I’ve been able to see three very different and very brilliant new plays, each fronted by the wonderful Birmingham Rep. They’re not all digital, and they’re certainly not all Shakespeare, but each seems relevant, in one way or another, to some of the ideas I’ve been thinking about on this blog. Charles III by Mike Bartlett, on national tour. An imagined history play that opens with Prince Charles taking the throne after the death of his mother, Queen Elizabeth… it’s not so much a Shakespeare adaptation as it is inspired by Shakespeare’s craft and style. Written mostly in verse, and with three interweaving plotlines, Bartlett’s play echoes questions about power and kingship that surface across Shakespeare’s history cycles while still feeling very much like a new and separate creation. The verse itself is, perhaps inevitably, strikingly different from Shakespeare’s own — lyrical passages or poetic phrasings are rare, with Bartlett instead favouring a more functional, prosaic, and often very funny brand of iambic pentameter. The Shakespearean inflections build as the play progresses, most notably in the characterization of the three male royals: Charles emerges as a Richard II-eque anointed king, William as a seemingly inscrutable and ultimately rather crafty Bolingbroke, and Harry as, well, Prince Harry/Hal. The result is smart, provocative, and surprisingly profound. Like Shakespeare’s plays, Charles III is packed with philosophical and political debate, but it’s never straightforwardly ideological. It voices royalist and republican views, but it resists taking sides in its examination of what monarchy represents in the twenty-first century. How do we reconcile the glitz, the celebrity, and vapidity with the history, the ceremony, and tremendous energy that goes into keeping the idea of monarchical power, in such reduced shape and form, alive? Is this a ‘golden age of monarchy’, as Charles ironically calls it, which ‘bothers no one, does no good, and is / A pretty plastic picture with no meaning’? If so, what’s the point? Black Tonic, The Other Way Works, touring next to Bristol and Bradford. ‘Interactive theatre meets mini-break’, according to the production publicity, and that’s as good a one-line description as any I can think of. Staged in a real hotel (the Radisson Blu in Birmingham’s case), the show guides an audience of just four people through a detective story crossed with a meditation on the experience of space, time, and identity in a 24-hour, networked world. We begin in the lobby before taking the elevator up to ‘our room’, where scenes start occurring in the corridor, in our bedroom, in the room next door, in a conference room nearby, and eventually on the street outside of our window. The production makes the most of the strange no-space that corporate hotels can be: ‘we want you to think that you’re the only one who has slept in this bed’, a film on one of the room televisions tells us, that we’re in an intimate, safe, private space that exists only for us. And yet we know that this is in fact a strangely public space, that hundreds if not thousands of people have been here before us, that the labyrinthine corridors connecting our rooms lead us through alien, artificially lit spaces maintained at night by people we rarely see… in other words, The Shining was set in a hotel for a reason. I won’t give away too much about the plot, which centres around two different couples that a sinister relationship manager is trying to break up, but I will say that I found the production’s mix of narrative storytelling and ambient immersion brilliantly judged, and the acting and technical coordination truly impressive. Hiding in a bathroom with a fellow audience member and an actor, watching another scene unfold in the reflection of the mirror in front of us, was a voyeuristic and visceral highlight, as was setting my mind adrift in the soundscapes and visual beauty of the production’s two inset films. On a more techy/digital note, I left thinking about how digital modes of performance might integrate with very human, embodied, and experiential kinds of theatre, and furthermore how they can be as much about intimacy and isolation as about collectivity and the global. Black Tonic 2015 Trailer from The Other Way Works on Vimeo. A Translation of Shadows, Stan’s Cafe, touring around the UK. In a week of unusually difficult to describe shows, this one is perhaps the most summary-defying. But let’s try anyway… inspired by the early twentieth-century tradition of the Japanese benshi — that is, live performers who provided in-person narration for silent films (including dialogue and scenic description) — Stan’s Cafe’s new show explores the relationship between art and interpretation, showing and telling, mimesis and diegesis. In the process it also considers the relationship between art and reality, but let’s set that to the side for now… The show opens with an imaginary, modern-day benshi taking the stage, welcoming his audience, and introducing the film — Shadows — that we are about to see. The lights dim, the film begins, and so does the narration, which is energetic and amusing if fairly mundane (‘here’s a train’). The benshi‘s running commentary is rather like having the director’s track turned on while watching a DVD, with bits of trivia and anecdotes peppering the narration. He directs us in the art of reading a film (‘everything is included for a reason’), and he draws our attention to changes in camera perspective as well as the back stories of the actors. His approach is the antithesis of Susan Sontag’s ‘Against Interpretation’, which argues that critical ‘interpretation amounts to the philistine refusal to leave the work of art alone’. And yet, as the play continues, he also becomes the illustration of her essay, with his increasingly controlling commentary revealing ‘a dissatisfaction (conscious or unconscious) with the work, a wish to replace it with something else’. That something else is the story and the actors as he chooses to imagine and experience them, and so Prospero-like he begins interacting with and manipulating the ‘shadows’ that we’re watching on the screen. In a tweet after the show, I described it as Lost in Translation meets Synecdoche, New York meets Mystery Science Theater 3000, and I still think that’s as good a summary as I can manage; sometimes it’s easier and more accurate to say what something’s like than what it actually is. There’s one more show tonight in Birmingham, before the production sets off for Blackpool. So that’s it for a brilliant week in the theatre, which clearly left me with abundant food for thought. One final note is that at the start of the week I had the chance to visit Birmingham’s new Impact Hub in Digbeth, which is a creative co-working space dedicated to building ‘a better Birmingham, one that is fairer, more democratic and more inclusive’. 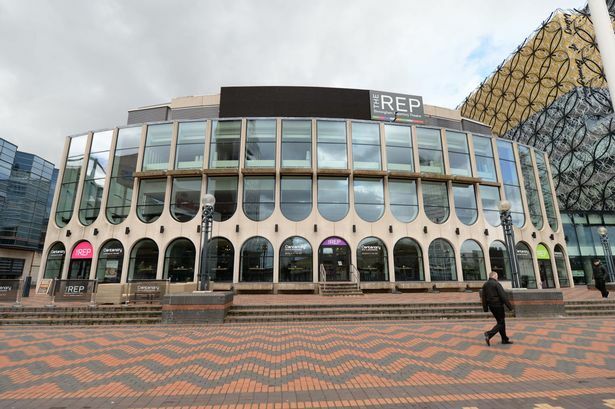 They have some beautiful working spaces, and some really inspiring plans, and I hope to find myself back there, as well as the Birmingham REP, in the weeks and months to come.